A gas turbine-driven locomotive. 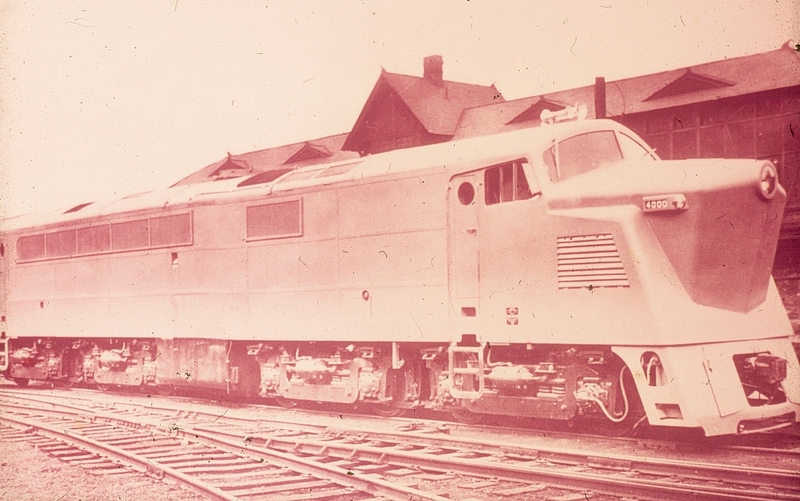 By 1948, the Westinghouse Electric Corporation also built an experimental 4000 hp gas turbine-driven locomotive with the Baldwin Company of Chester, Pennsylvania, that used two of W21 gas turbine units. Initial operation was on the Union Railroad of Pittsburgh, burning distillate fuel oil. Later, operation was on the Pittsburgh and Lake Erie Railroad using residual oil fuel. Originally called the Westinghouse Electric Company, George Westinghouse (1846-1914) founded his manufacturing company in Pittsburgh, Pennsylvania, on January 8, 1886. In 1889, he renamed his business The Westinghouse Electric and Manufacturing Company. Westinghouse's primary products include turbines, generators, motors and switchgear related to the generation, transmission, and use of electricity. The company changed its name to Westinghouse Electric Corporation in 1945. In 1981, the company began to relocate its division headquarters for the Steam-Turbine Generator Divisions from Pennsylvania (turbines from Lester and generators from Pittsburgh) to Orlando, Florida. The Power Generation Business Unit (PGBU) building was located in The Quadrangle, at 4400 Alafaya Trail. Originally, Westinghouse had purchased a large plot of land for future development that extended westward from Alafaya Trail to Rouse Road. The original headquarters was located on several acres of that land parcel close to Alafaya Trail. As the PGBU grew in size, other buildings were rented and then, after PGBU was sold to Siemens Corporation, additional buildings were added to the complex. In 1994, after a major corporate management shuffling and commitment to change from an industrial manufacturing company to primarily a broadcasting/communications company, Westinghouse bought the CBS Network and changed its name to the CBS Corporation. As the PGBU grew in size, other buildings were rented and then, after PGBU was sold to Siemens Corporation in 1998, additional buildings were added to the Quadrangle. Original sepia photograph: Private Collection of Harry L. Jaeger. Digital reproduction of original sepia photograph. Westinghouse Electric Collection, RICHES of Central Florida. Copyright to this resource is held by Harry L. Jaeger and is provided here by RICHES of Central Florida for educational purposes only. "Westinghouse Power Generation Booklet." RICHES of Central Florida. https://richesmi.cah.ucf.edu/omeka2/items/show/6422. 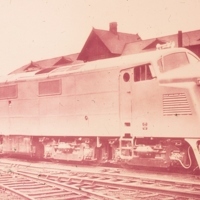 “Gas Turbine-Driven Locomotive.” RICHES of Central Florida accessed April 22, 2019, https://richesmi.cah.ucf.edu/omeka/items/show/7712.